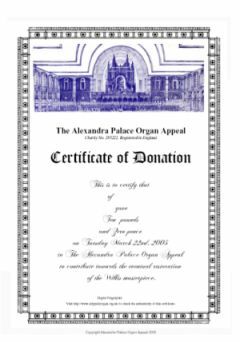 We much appreciate your support for The Alexandra Palace Organ Appeal. To carry out our activities of funding continued restoration and arranging concerts, we rely on public donations. Please specify the amount you wish to donate below in United Kingdom Pounds Sterling. Then, click the button to be redirected to our secure payment provider Worldpay, who will accept your credit card details. The Alexandra Palace Organ Appeal will be notified that you have made a donation, but this information will not include your credit card details, which are held only by Worldpay. Refund Policy: refunds of credit/debit card donations are made at the discretion of Treasurer of The Appeal. Contact our customer services via email at info4@allypallyorgan.org.uk, telephone on 07070 907729 or see our Contact Us page for further contact details. In addition, you have the right to cancel a donation within seven days of making it. In this case, contact us and your donation will be returned. We regret that we must ask that you Contact Us first before using this online donation facility. Otherwise, it will not accept your payment. Once you have made a donation, visit our certificates page here to download your certificate of donation.